Installed in the Autumn of 2012 this has now become an important feature of the new housing on what was the Windmill Estate. The design by Andrew Tanser and Andrea Bassil is engraved on two sides of black granite, representing Fulbourn village life and history. It is well worth studying. Full details of the monument can be found in the February issue of The Mill, Fulbourn’s Parish Magazine. Copies are available from the church shop, Twelve, in the High Street, or a copy can be viewed in the Library. 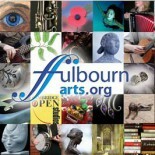 Fulbourn Arts is a group set up to organise and promote arts events in the village of Fulbourn, Cambridge, UK. New members of the group are always welcome, as well as additional volunteers we can call on to help manage events.